The M.A.B. 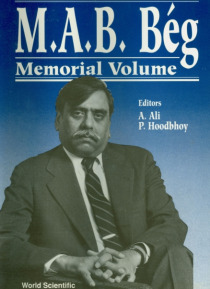 BEG MEMORIAL VOLUME is based on scientific articles written in honor of the late Mirza Abdul Baqi Beg, a professor of physics at the Rockefeller University, New York. The contributed articles are partly based on talks given at the school on high energy physics and cosmology, held March 11 - 25, 1990 at the Quaid-i-Azam University, Islamabad, Pakistan, and partly on articles contributed … by his colleagues and collaborators.Being a scientific tribute to Beg, the articles reflect the specific areas of his scientific research and the contemporary trends and open questions in elementary particle physics. Deciphering the mechanism of symmetry breaking with the help of known properties of elementary particles - their masses and couplings - and devising new experimental tests to find clues to the actual physical phenomena at work, are the recurring themes in this book. The role of higher symmetries, formulated in terms of the string and grand unified theories, likewise is elucidated in several articles.The book also contains one of the last articles authored by Beg, written in honor of Luigi Radicati, describing a scientific history of the crucial development from the quark model to the standard model which took place in the sixties.